Philips recently released its third-generation Hue smart LED bulbs, and they’re seriously better in every conceivable way. They still support 16 million colors, but they offer deeper, more bold shades. They still offer a range of color temperatures on white light, but that range now encompasses 50,000 different shades of white. These are seriously the Mercedes of smart bulbs, but you don’t have to pay Mercedes prices thanks to Amazon’s current sale. 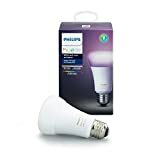 For a limited time, you can save 12% on a Philips 464503 Hue White and Color A19 LED Bulb.